My name is Natalie Floyd, and I live in the vacation capital of the world in Central Florida. I would love to help you enjoy the area I get to call home! Before moving to Florida, I lived in the beautiful mountains of Chattanooga, Tennessee, but I grew up near Baton Rouge, Louisiana going to LSU football games on Saturday night! As a kid, I always looked forward to our family summer vacations, but my favorite was always Disney World. I took my first trip to Disney at five years old and began helping my parents plan trips when I was a teenager. It was always my dream as teenager to plan trips for people when I was older, and now I am! One of my favorite things to do is to take trips and make memories with my family, and I love the planning part that gets us there. I have a wonderful husband who puts up with my constant need to be planning our next big trip, and I have two wonderful children, Zach and Zoey. Zach is my thrill seeker always looking to conquer his next big ride while Zoey loves to meet as many princesses as she can. Zach was diagnosed with cancer as a baby, and since then, we have made making memories together as a family our priority. Now, nearly 5 years cancer free, we still love planning our next big adventure soaking up each moment together. Vacationing with kids can seem like a daunting task, but I have learned how much fun vacations can be even at a young age. 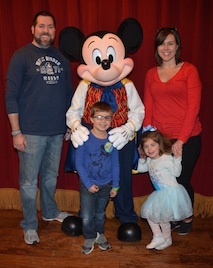 Both of my kids took their first trip to Disney at just a few months old and took their first Disney cruise at the age of 1. There is nothing like seeing the sense of wonder and amazement on their faces as they travel to new places and see their favorite characters come to life. Being a travel agent has allowed me to combine two of my favorite things: travel and planning! As your travel agent, I will help your family plan your vacation that you will remember for years to come! I have experience in not only planning a trip for families with little ones, but also for extended families, honeymoons, girls’ trips, and so much more. With experience in a variety of destinations such as Disney World, Disney Cruise Line, Universal Studios Orlando, SeaWorld, and other cruise lines, I am ready and able to help you with wherever you want to go! I do the training, research, and stay up to date so you don’t have to! I am a graduate of the College of Disney Knowledge, so I have researched and gathered information to help you plan your magical vacation! From helping you stay within your budget, to planning and booking your vacation, I can help you with all the details of your Disney vacation! I can make your Advanced Dining Reservations, recreation, and entertainment plans. I can even do itinerary planning for you! From beginning to end, I can help make the planning easier for you! Connect with Natalie on Facebook!